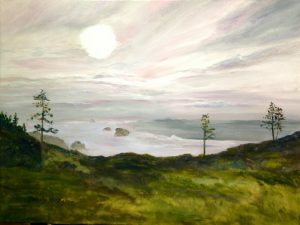 My new painting “Misty Sun” was rendered from a photograph taken by my student Terrisa Burke on December 1, at 10:53 am, standing in Ecola Park looking out in the distance to Hay Stack Rock. Thank you Terrisa for sharing! This painting/photo speaks to me with tons of ambiguous excitement. When I first saw the photo my thoughts raced to the obscurity of the sun…or could it be a shrouded full moon at twilight? The scene moved me in so many ways, oh, the uncertainly of the fleeting mist and fog. 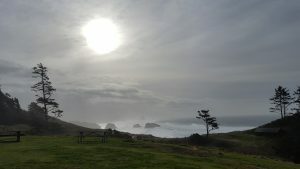 Will the sun triumph or will the mighty pacific winds blow even more mysterious veiling? How often this scene parallels the fragilities of life as the deep burning passion that unlocks our true identity often layered by the fog of our actions. Even so, the love and passion for truth, as in this painting drove me to find the softness and power in the ambiguity of the day. Cheers to the passionate love of nature and life. Cheers to every artist and lover trying to reach that ultimate scene on their elusive individual canvas.